Social media platforms such as Facebook, Twitter, and Instagram are great for staying in touch with family and friends. With their ease of use these social networks have become the world’s largest database of accessible, personal information. Unfortunately, it is easy to forget that while you are connecting with friends and acquaintances, cyber-scammers and identity thieves are lurking on those platforms too. Here are some guidelines to keep you safe. In lieu of making them public, adjust Facebook privacy settings so that your posts are only visible to friends or friends of friends. Uncheck the “Discoverability” boxes in Twitter’s safety and security controls to prevent searches using your email address and phone number. If you’re only using Twitter for private communications, check the “Protect your tweets” box, which limits your posts’ visibility. For your personal Instagram page, simply set your account to private. If you’re not sure about the destination, don’t download or click on the link. Be wary of out-of-character posts from friends, and always double check the sender’s email address when you receive an email. Save your cell number to each platform and require text messaging to confirm your identity when you log in on a new device. This two-factor authentication or login verification, can keep your accounts secure even if your username and password are stolen. Facebook also allows you to adjust various security settings, such as for unrecognized logins. Enable login verification on Twitter. Software updates for your desktop and mobile apps include critical security patches that protect your data from new threats. Update your systems as soon as you are notified in order to protect your accounts. Don’t share your address, that only helps thieves target your home. In addition, be careful about sharing specific travel plans — your vacant home could quickly become a target. Uncheck the “Tweet with location” box on the “Privacy and safety” settings page on Twitter. On Facebook and Instagram, go to your phone’s settings, find location services, and disable them for the individual apps. Passwords are one of the keys to protecting your identity. Be sure to use strong, secure passwords to keep your information safe. Quizzes that promise to identify your celebrity doppelgänger, assemble a bank-heist team, or test your hometown loyalty are often nothing more than information-siphoning schemes. Even though they assure you they won’t post to your feed without permission, their ultimate goal is to woo you into surrendering your profile information and friends list. You’ll find folks of every stripe on social media: friends, trolls, criminals and more. Stay alert and adopt a few smart practices in order to socialize safely and keep your personal information private. As your business grows, so does the likelihood of your systems being the target of cybercrime. One of the best ways to protect yourself is by enforcing the use of strong, secure passwords for yourself and your employees. If followed, the guidelines can provide you with a password that is not easily broken. Be a moving target…change your password often. Never use the same password for multiple sites. The problem is that if one site gets hacked they all get hacked. The LinkedIn hack of 2016 compromised over 117 million usernames and passwords. Users that registered the same email address and password on other sites were at risk(and may still be!). Make sure your password is sufficiently complex. Passwords like 12345678, password, Password1 are easily guessed. Adding complexity by mixing capitals, lower case, numbers, and special characters like ! @#$%^&* makes it very difficult for other people to guess your password. Make sure your password is long enough. Computers today can guess passwords at an alarmingly fast pace. Even medium grade hardware can run through millions of password attempts PER SECOND! Complexity makes is more difficult for people to guess your password, and length makes it harder for computers to do so. Never share your password or make it easy to find. A sticky note on the bottom of your keyboard is not a secure hiding place! At ITSecureNow we are fans of the sentence style password like “Juvenile32InsaneMonkey!” or “SmoothRed45Vase$”. These tend to be much easier to remember than randomly generated passwords like Dj$&ch#15D4. They also meet the complexity and length requirements mentioned above. 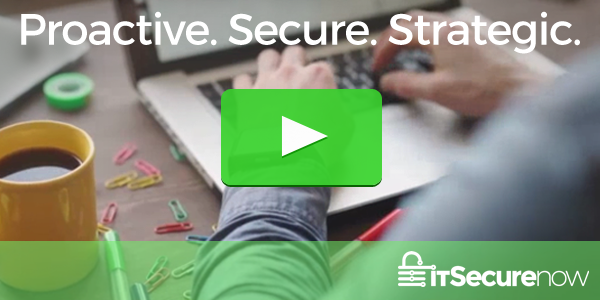 The team at ITSecurenow are experts in securing networks of all sizes. Contact us today to learn more. LinkedIn is a popular social platform for working professionals and organizations to highlight their skills and construct a network. There are many ways to use this platform to your advantage; however, there are security concerns that you should be aware of. Creating a strong password is the first step to protecting your account. A common mistake is using the same password for multiple accounts which can make them all vulnerable if even one site suffers a data breach. LinkedIn has been the victim of cybercrime in the past and a post-mortem showed that LinkedIn was plagued with weak and duplicated passwords. There are security measures set up by default in LInkedIn that will hide your contact information from those who are not in your network. But if you accept a fake profile into your network then your information is already in jeopardy. With access to your work history, email, and other connections, someone behind a fake profile could steal your identity. LinkedIn communicates to its users by sending messages to their Inbox. These messages include updates on new connections, new endorsements or policy changes. These messages are read only and are typically legitimate communications. However, if you receive an email requesting documentation to verify your identity, it is most likely a phishing scam. ITSecureNow is dedicated to protecting our clients’ security. Watch this video to better understand the security concerns surrounding LinkedIn and how you can stay secure while using their platform. Read “3 Easy Steps to Improve Computer Security” on our blog for more tips on how to protect your business. We are almost a full month into the New Year, and given all the happened in 2017, 2018 is welcomed opportunity for added IT security. ITsecureNow sets ourselves apart from other companies in our industry with our state-of-the-art equipment and knowledgeable team members. We recently sat down with Network Security Engineer Paul Fields to get a better understanding of what happened in 2017 and what we can expect in 2018. Paul works closely with our CEO, Lorne Sykora. He mastered the skill of adaptability working one summer as a dog fence installer and easily describes ITsecureNow as committed, collaborative and valuable. Here is what Paul has to say about his work, data security and what he expects to see in 2018! What is the most unusual job you have had? I installed underground dog fences for a summer. Anytime you have pets and pet owners as part of your day to day work, interesting things are likely to happen! Although many of the jobs were interesting, one in particular sticks out to me. Usually when people want an underground dog fence it is for their yard. However, I had a customer who wanted a fence installed in the crawlspace of her home so that her dog could only go into certain rooms of the house. It was extremely complicated developing the layout for the wiring so that the dog could move freely in the rooms that he was allowed in while being prevented from entering rooms he was not. What is one skill you would like to master? If I could master the skill of effective communication my job would be much easier. Understanding a customer’s point of view, needs, wants and pain points greatly determines what kind of direction ITSecureNow would recommend to a them. I love the fact that I never stop learning new things. I am always studying the newest technologies as well as learning about how companies do business. The crux of my job is to figure out how to bring those two things together to accomplish our client’s goals. What were some of the biggest developments you saw in 2017? While massive breaches like Yahoo and Equifax dominated the headlines, in 2017 more than half of all cyber attacks were targeted at small to medium-sized businesses. Attackers have started to wake up to the fact that smaller businesses have valuable information and usually fewer resources to protect themselves, making them an easier target. Ransomware, phishing, and malware attacks continued to be the most effective ways that attackers gained entry into company networks. 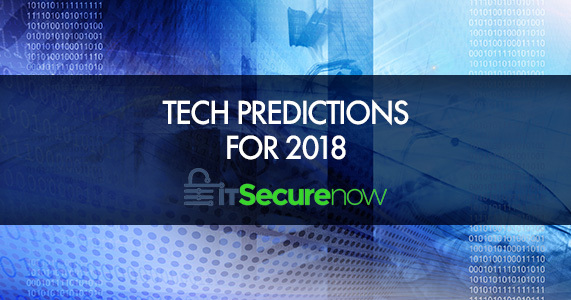 Where do you think the security industry will go in 2018? 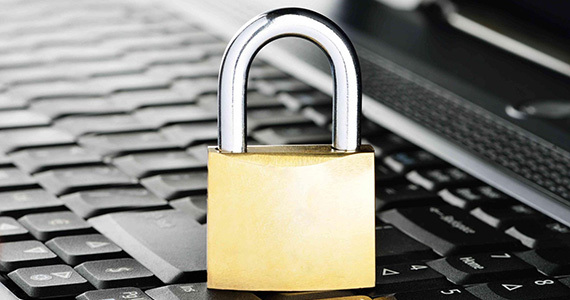 When it comes to information security, companies are starting to see the benefit in prevention. The consensus is that more companies, large and small, will increase their security budgets to get out ahead of the curve. Cyber attacks will continue to grow in both frequency and scale, especially in the small to medium-sized business market. I see a trend of 2018 that information security will continue to become a “part of doing business” rather than something reserved for multinational corporations. In return, the security industry should continue to move in the direction of trying to be more business conscious, helping companies to maximize productivity as well as security. What is the best advice you can provide someone to protect himself or herself going forward ? Whenever possible, apply patches to your operating systems(Windows Updates), as well as third party software like java, Chrome, Firefox, Adobe products, etc. Do not use the same password for everything. The danger in it is if one account is compromised then all of your accounts are at risk. It is best practice to have a different password for every service that you use. Password Managers are great in helping with this. In work environments make sure that administrative rights are limited to only those that absolutely need it. End users that can install their own software are also capable of inadvertently installing malware that can cost your organization a great deal of time, money and reputation. Make sure to change any default passwords on devices that are on your networks. This includes routers, switches, firewalls, etc. IoT devices like wireless surveillance cameras, webcams, wireless thermostats, wireless speaker systems, wireless lighting solutions, and the like are notorious for having default credentials left intact, thus making them vulnerable to attack. Knowledge is power. 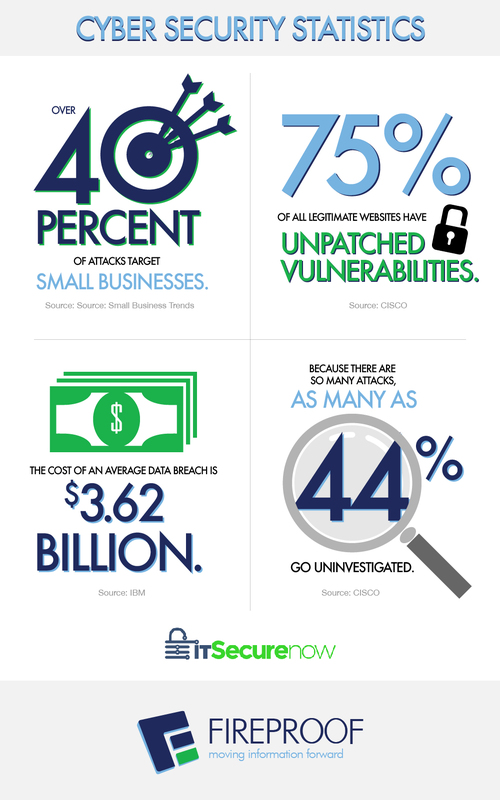 View our Cyber Security Infographic to understand the state of cyber security. For more information on our services, or to get started, contact the experts at ITsecurenow today. The Internet is a valuable tool. Employees are able to work in remote and home office settings and also stay productive on the road through the use of various applications and cloud-based services. Families are able to stay connected to loved ones far and near with the simple click of a mouse. It also provides an opportunity for criminals to easily gain access to critical information. Now, more than ever, it is important to stay safe online. 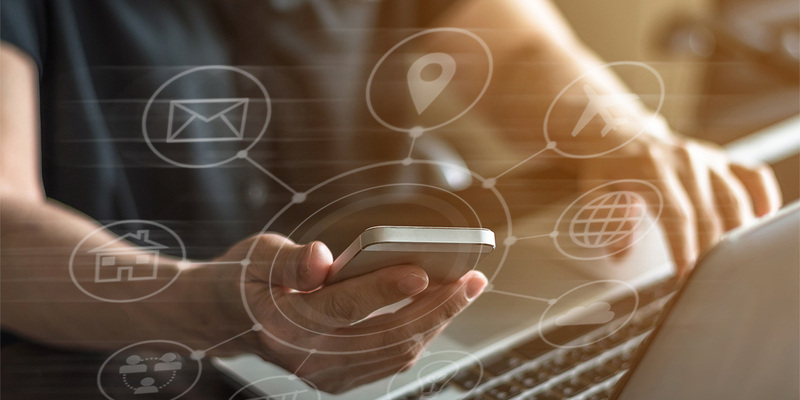 Various threats, including viruses, malicious software, and data breaches can compromise personal information and have devastating effects on individuals and businesses. While these threats can never be completely avoided there are steps you can take to reduce your risk of being a victim of a cyber-criminal. Strong passwords are a cyber-thief’s greatest enemy. Be sure to use a combination of letters, numbers and symbols to make it more difficult. Never use a complete word; those are the easiest for hackers to guess. There are a variety of tools available online that will help generate random passwords for you to use. And be sure to use a different password for each website. If the same password is used for each place you login, it is much easier for a hacker to take over your identity online. Two-factor authentication confirms your identity by sending a unique code to your phone or email to use before being able to login to a website. This improves security because the person trying to hack into your account would have to have access to both platforms to login successfully. While this does take extra time, it is definitely worth setting up to keep your account safe. Perform your computer or phone’s operating system update as soon as you are prompted to do so. These updates often fix bugs in the system and patch security flaws that can be exploited by malware. Cyber-security is imperative to the protection of your personal information. 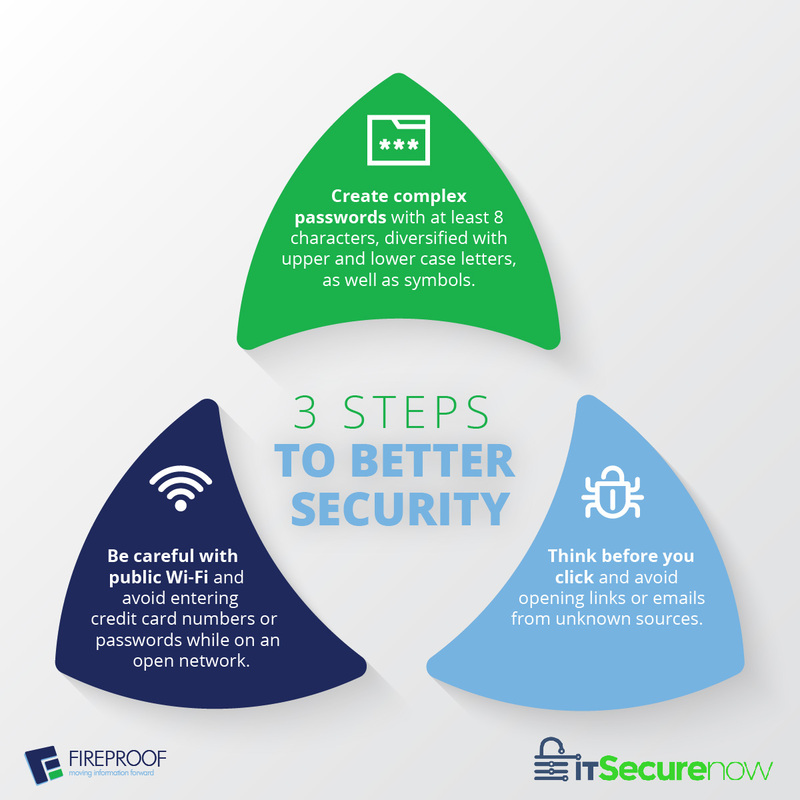 For more information on how you can protect yourself from falling victim to the next security breach, read “Three Best Security Practices” on our blog and contact the security experts at ITSecurenow. Tales of true terror are happening in data centers far and near. Sinister outages and bone-chilling cyber security threats are enough to give any IT professional nightmares. Daily news reports highlight the latest victims in the ghastly data breach saga. 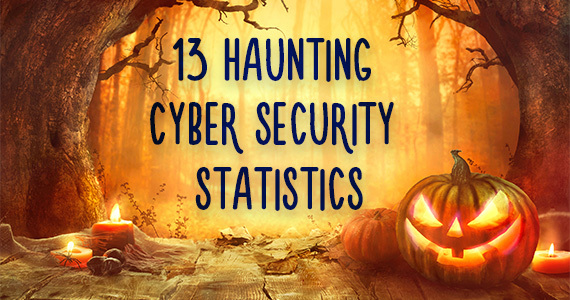 The team at ITSecurenow gathered these haunting facts about cyber security. Read on…if you dare! The old adage “it will never happen to me” is dangerously untrue. However, the nightmare can end. The villains don’t have to win. 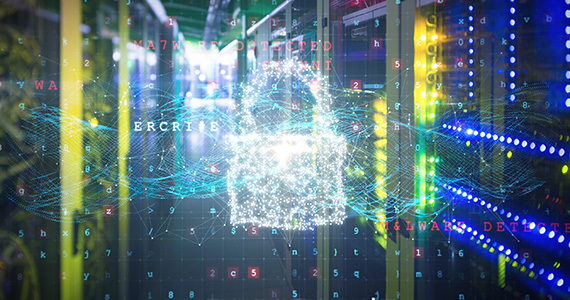 The professionals at ITSecurenow offer our Breach Prevention Platform, a tool to help prevent your business from being the latest victim in the terrifying cyber security attacks. Contact us today so we can show you how we can help protect your business. 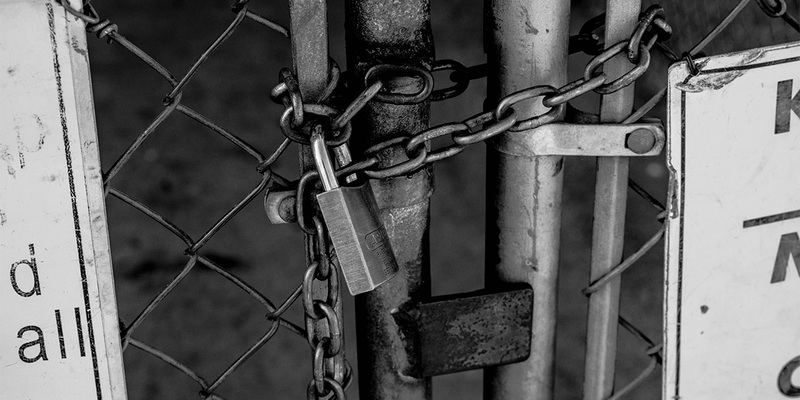 With a new security threat seemingly popping up every other week it can be hard to know what to do to best protect yourself and your business. Ultimately some of the best ways to keep your data secure are to following the industry “rules of thumb”. Below are a few of these best practices from Fireproof IT Manager and vCIO at ITSecurenow, Lorne Sykora. Contact us now for your FREE Vulnerability Assessment. ITSecurenow is changing the way Managed IT Services are delivered by offering end to end security with proactive business technology solutions. We keep your technology humming so you can focus on running your business.